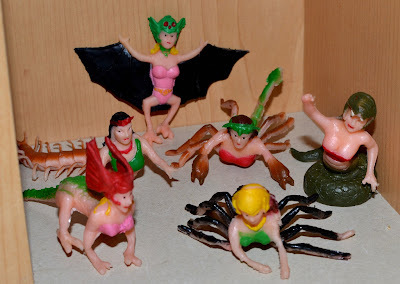 What: A set of six soft rubber half-woman, half-animal monsters that bring to mind retro sci-fi B movies. There's a serpent woman, lizard woman, spider woman, centipede woman, bat woman and scorpion woman, all with painted details. Where: I bought my set (sold individually) at an art shop in the mid/late 90s but saw them still available into the '00s through Archie McPhee's catalog. 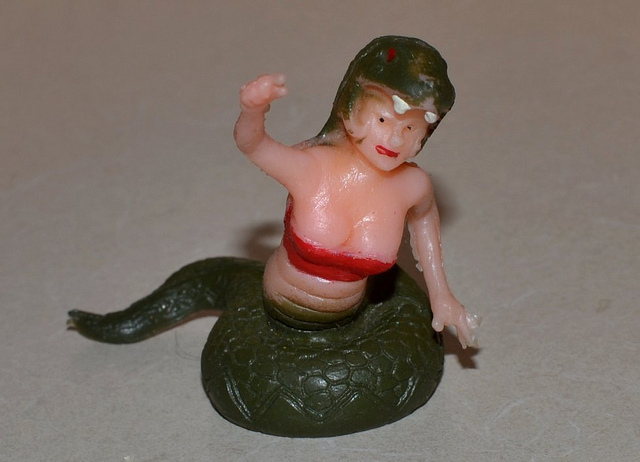 Who: Produced by Accoutrements Inc.
Serpent Babe was my favorite, too. I think I got these in a set at some novelty or souvenir shop up near Bandon, Oregon, where I seemed to get most of my weird rubber guys. I even wrote a dumb story around them when I was a budding young writer -- I got inspired by everything.